I screamed like a girl as a snake slithered over my shoulder in the dark movie theatre. My heart rate slowed as I realized the snake was only air, a special effect at the movie Quebec Zoo sauvage de Saint-Félicien uses to orient guests to it’s overnight Adventure in the Land of the Caribou. I wanted to learn more about the animals that inhabit Canada’s boreal forest and I didn’t want to suffer to do it. Instead of paddling or hiking into Canada’s north I was starting my quest with the zoo’s ‘behind-the-scenes sleepover with caribou and moose. Our group of travelers carried our overnight bags past the Zoo’s polar bear, Dall sheep and other northern species to our nature bus. Guide Audrée Morin switched effortlessly from French to English, “Welcome. We are going into our Nature Trail Park.” Within these 3.24 km2 the animals roam free and people are contained. We cruised by black bears, elk, and bison, our cameras and smartphones clicking. 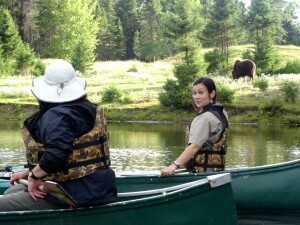 Our destination was a tented camp in a forest we shared with moose and caribou. Bears and other creatures were kept out by electric fence. As we walked the last few meters into camp, a caribou faded into the shadows. Two moose orphans popped their long noses over a wooden corral, eager to see if we brought food. Prospector tents ringed a large fire pit; wood ready to light, dining table and benches were visible in a long screen house across the clearing. The animals were different but the place felt like an African safari camp. There was time before dinner to canoe nearby Lac Montagnais. Spotting a muskox on shore, Morin explained, “Stay to the left of me as you paddle. That way you won’t get too close!” It reminded me of canoeing the Zambezi River, but here muskox and bear took the place of elephants and lions. I nibbled my trout dinner as people relived events of the day, some in French, some in English, but the smiles understandable in both languages. I crawled into my sleeping bag atop balsam fir boughs, the smell better than any a fake tree air freshener could deliver. The next morning it was time to feed the moose before boarding the bus and returning to the rest of the zoo. There was time to visit wolverines – a boreal creature I’ve seen only in nature movies – and lynx before leaving the zoo for another boreal experience – meeting a wolf. Gilles Granal of Aventuraid/Parc Mahikan runs a wildlife observation center with three packs of wolves. Two of the packs – one Arctic wolves, the other, grey wolves – are wild. A third pack of seven grey wolves are imprinted on humans and enjoy visitors. For $50 people can participate in a face-to-whisker experience assuming the wolves are willing. Granal explains “I don’t do these encounters for the visitors’ benefit, I do it for the wolves. They enjoy the stimulation.” I looked forward to being a play toy for an animal often misunderstood by humans. Granal reduces the risk of these encounters by entering the enclosure first to read the mood of the pack. If he feels the wolves are not receptive to visitors, no one else goes in. Fortunately for me, the wolves were feeling friendly and the gate was opened a few inches to squeeze our group through. We were warned to wear clothes we didn’t mind getting dirty or torn and to tuck our cameras under our tops. Wolves love to chew and anything hanging loose can be snatched. We lined up against the fence like suspects in a police lineup as the wolves greeted us, their excitement palpable. Within seconds I was looking into the dark eyes of a cream-coloured wolf, it paws resting on my chest as it licked my face. Another sniffed at places not polite to notice in human culture. “They will calm down soon and you can move away from the fence,” Granal predicted. Soon the novelty faded – only for the wolves, mine was still there – and we walked into the woods of the enclosure. My face was well licked by several wolves as I lowered myself to the ground. I felt rude for not licking them back; to compensate I rubbed all the bellies being offered up. As I scratched their smooth fur and dodged the licks aimed at my eyes, I almost forgot I was sitting among skilled predators. Granal has created a bridge between wolves and humans and I was happy to cross it for a few minutes, immersed in the socialness of the pack. I had found my boreal wildlife and I was far from suffering. This overnight Adventure in the Land of the Caribou is not to be missed! Click to Tweet. An African safari camp in Canada. My friend @Reinventure went there! Discover more: Click to Tweet. Discover how to get close with Canadian wildlife on this amazing adventure: Click to Tweet.